Charles Garrett is an anti-terrorism expert with Special Branch. When terrorists began to strike close to home, the British government created a small group of agents into an elite bureau called PACT, or Punitive Actions, Counter-Terrorism. Tasked with working closely with the Special Branch but also able to share the resources of MI-5 and MI-6 as well as the various military intelligence groups, this group was designed to be Britain's counterterrorism enforcement arm. Empowered to do what it takes to keep the country safe, the director chose the best people for each job. Unlike Special Branch whose job it was to arrest terrorists, PACT was empowered to eliminate them. Heading PACT was an experienced Brigadier named Bleke, a former director of operations for MI-6. Since PACT was meant to be largely off-the-books, it created a front called the Diversified Corporate Facilities. Government funds could be funneled into this paper holding company and used as its director saw fit. 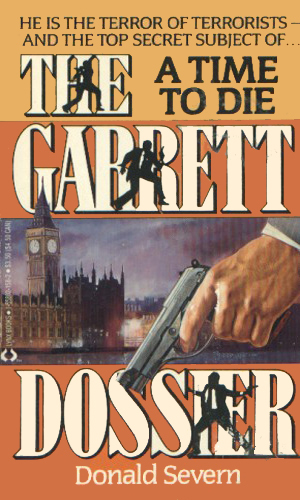 For the enforcement with extreme prejudice duties, he picked Garrett, an agent who had worked undercover in Northern Ireland before the murder of his wife ended that assignment. Now Garrett lives for his job, having little else. And he shows again and again why he is the very best at destroying the enemy, no matter what it takes. This series has two authors listed as writers. They are the same man. The first two books were published under the pseudonym of Donald Severn but the latter two were under the real name of the author, Frederick Nolan. The first two were released in the US as well as the UK. The latter two probably were not released in America. 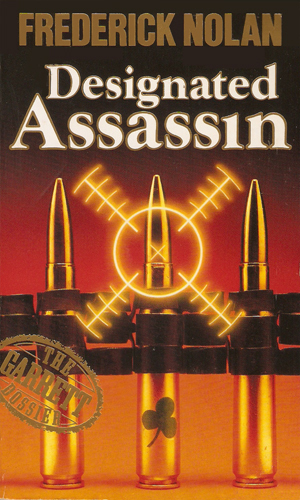 A team of assassins have infiltrated England with an outrageous plan. Garratt is the best man to stop them because he most thought like them but his plan makes him the hunted, on purpose. 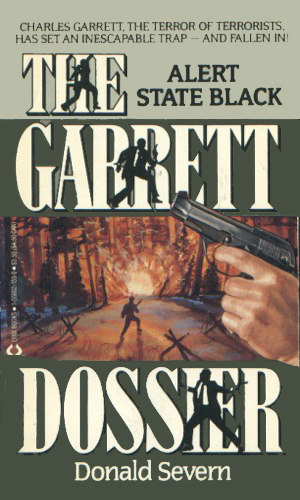 Given a chance to destroy a terrorist cell in Germany lead by the man who killed his wife, Garrett is not in the mood to deal with an Intelligence officer who is blocking his every move. 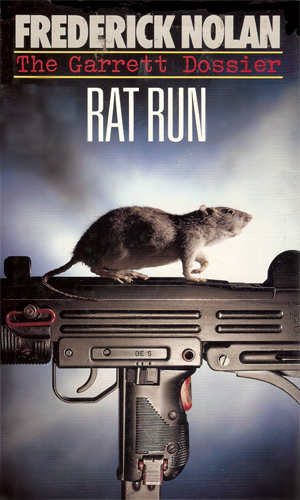 Out for revenge over the death of his wife, Charles Garrett heads into the chaos of Ulster to find the IRA agents responsible and soon finds that his greatest enemy is even closer, possibly himself. The series of strange suicides by scientists of different studies has been named the Trail of Death and Charles Garret, a specialist in death, is assigned to find out what is behind it. In the South, there is a joking defense to homicide stating, "he needed killin'." That succinctly sums up Garrett's attitude to the bad guys he faces. They need killing and he is darned good at it. The stories are straight-forward, in-your-face action and fun to read. They don't require a great deal of thinking - just reacting and enjoying. Garrett is the kind of a hero you want to watch. He is usually respectful, friendly, hard to anger, and deadly when ticked. It isn't a good idea to get him ticked. For all that these books sound like B-movies, the writing is terrific, the work of a true master. This raises the class of these books considerably and makes reading them an incredible pleasure. When I read the first two, thinking that was all there were, I was very sorry to see them end. Several years later, learning there were two more published under the author's real name, I made sure I went back to the first two to work my way back into Garrett's world properly. I was not disappointed.